IT TOOK seven attempts, but the organizers finally worked out the formula for a healthy Republican presidential debate: seven candidates, three moderators, and zero vulgar reality-show clowns. The wittiest and truest line of the night was Senator Ted Cruz's opening crack: "Let me say I'm a maniac, and everyone on this stage is stupid, fat, and ugly. And Ben, you're a terrible surgeon. Now that we've gotten the Donald Trump portion out of the way. . ." He was right. Trump's absence cost the debate nothing in substance, and the lack of crude insults was a welcome change of pace. 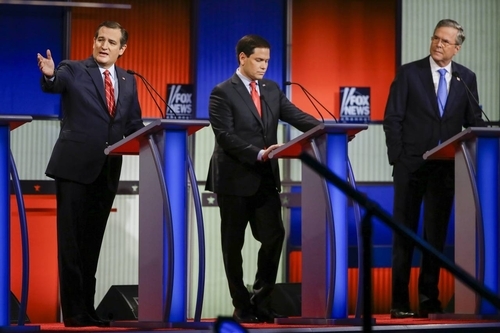 From left, Sen. Ted Cruz, Sen. Marco Rubio and Jeb Bush during Thursday night's Republican debate in Des Moines. Alas, what remained was still a stage full of politicians. Well, six politicians, plus one daydreaming neurosurgeon. Ben Carson actually seemed startled when questions were posed to him, and he was all but invisible for most of the evening. "You're not going to hear a lot of polished political speech from me," he said early on. In fact, we didn't hear much of anything from him. I have often said that just once I would like to hear a debate moderator ask presidential candidates not what they want the government to do, but what they believe the government has no business doing. I got my wish when Bret Baier challenged Governor Chris Christie to "name even one thing that the federal government does now that it should not do at all." For a split-second I fantasized that Christie, or another candidate, would rattle off some of the countless things the federal government shouldn't do: Legislate minimum wages. Mandate grade-school curricula. Ban incandescent light bulbs. Subsidize dairy farmers. Be in charge of airport security. Decide who qualifies for a mortgage. Force Americans to buy insurance policies. Christie's answer? He would defund Planned Parenthood. That's all he came up with. All those Republicans, and barely a drop of righteous indignation at the massive intrusion of Big Brother into virtually every aspect of modern American life. And these guys call themselves conservatives? Oh, it's to weep.